Loudoun Holistic Health Partners is pleased to welcome Kathy Blum to our in-house team of wellness providers. Kathy is a holistic health and nutrition counselor and the owner of My Homegrown Health in Leesburg, Virginia. She teaches individuals and communities about nourishing food and healthy living. She also holds a master’s degree in Holistic Health and Nutrition Education from Hawthorn University. Kathy’s passion for health and nutrition began 20 years ago after her young daughter was diagnosed with a life-threatening peanut allergy. On a quest to find nut-free food, she began reading labels and researching ingredients. Kathy was shocked to learn about the toxins in our manufactured food and soon realized that the only way to keep her daughter safe and her family healthy was to eat REAL food — the way nature intended. Since then, Kathy has made it her mission to help others transition to a healthy eating lifestyle. Kathy works with individuals, families and groups, to guide and support them with their wellness goals. She also leads store and farm market tours, community workshops, cooking classes and other events. Kathy’s holistic approach focuses on the understanding that the quality of our food, our lifestyle and our environment is key to our health and wellness. As an organic gardener and a supporter of local sustainable farms, Kathy teaches her clients where to find the most nutrient-dense food and how to properly prepare it. As an advocate and activist for food quality and transparency, Kathy also works with grassroots and national organizations to lobby Congress and other governmental agencies to ensure and protect Americans’ right to know what’s in their food, and to eliminate toxic chemicals in our food and our environment. Kathy lives in Leesburg, Virginia, where she and her husband love to grow organic food, hike, travel and explore the beautiful local farms and vineyards. But most of all, she loves spending time with her children and family and preparing and enjoying delicious meals together. Kathy is an active member of the National Association of Nutrition Professionals. Kathy is offering special discounts to members of Loudoun Holistic Health Partners Concierge program, and nonmembers as well. 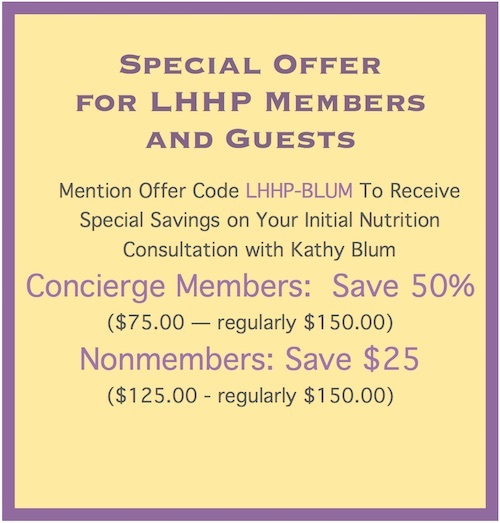 LHHP Concierge Members can receive 50% off their initial 90-minute holistic nutrition consultation with Kathy. Nonmembers can receive $25.00 off their initial 90-minute consultation with Kathy. During your initial consultation, Kathy will review your personal health history, health concerns, diet and lifestyle and goals.